Thank you for letting me know why our tax relief is important to you and your family! The Liberal Government has delivered income tax relief for all Australian workers. In passing our Personal Income Tax plan through the Parliament, the Government has ensured all Australians paying tax will be better off. They will be paying less tax, and will be rewarded for their hard work both now and into the future. Federal Member for Pearce, Christian Porter, said that taxes in Australia will now be lower, fairer and simpler and is a win for hard working Australians who want to get ahead. “71,539 taxpayers in my electorate of Pearce will benefit from tax relief of up to $530 in 2018-19,” Mr Porter said. “This is a win for all working Australians who want to get ahead - you will have the certainty that when you earn more, get a pay rise or work more hours, you won’t face ever-increasing tax rates. One: Tax relief for middle and low income earners now. 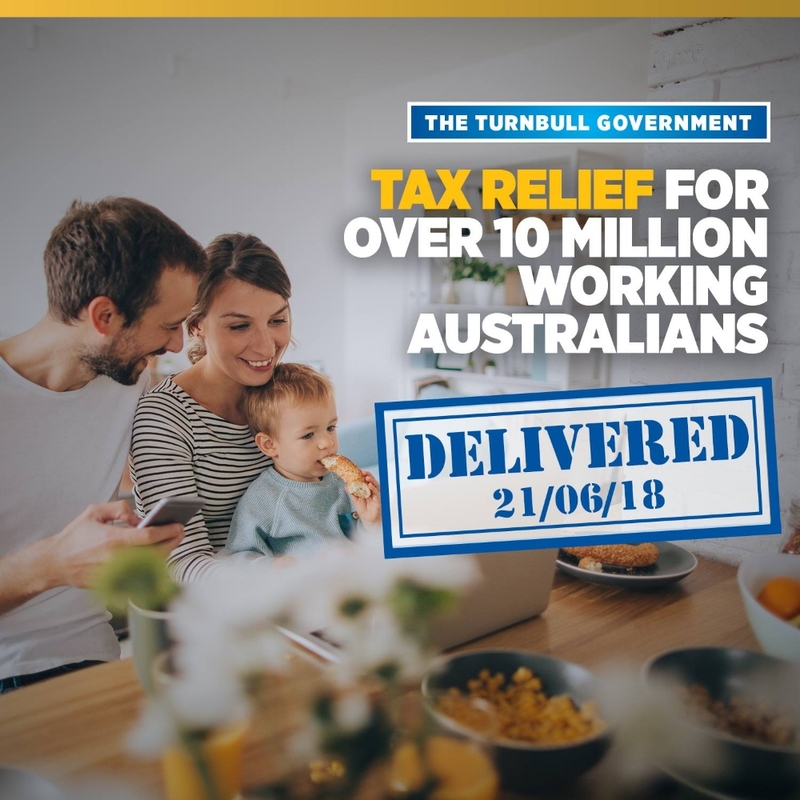 In 2018-19, over 10 million Australians will get tax relief, with 4.4 million Australians receiving the full $530 benefit. Two: Lifting tax brackets, to protect Australians from the impact of ‘bracket creep’, taking the $87,000 tax threshold to $90,000 in 2018-19 and then to $120,000 in 2022-23. Tax relief provided under the offset in step 1 will also be locked in from 2022-23 by taking the $37,000 tax threshold to $41,000, and lifting the low income tax offset to $645. Three: Ensuring more Australians pay less tax by making personal taxes simpler, removing an entire tax bracket, that will mean around 94 per cent of taxpayers are projected to face a tax rate of 32.5 per cent or less. “In contrast to the Labor Party, our plan is not about creating winners and losers. We are not putting up taxes on some Australians to pay for tax relief for other Australians,” Mr Porter said. “The Labor Party stands for higher taxes on all Australian wage earners and higher taxes on the businesses that employ them. The Labor Party has admitted it will rip $70 billion in extra income tax from working Australian’s pay packets over the next ten years.